In business as in life, integrity should be absolute. In an ideal world there would be standards that when set, would provide your employees and co-workers a path to follow that is straight and narrow. Doing the right thing even if its unpopular or against the mainstream philosophy, displaying unquestionable ethics, speaking the truth in spite of the consequences; how would society in general and business specifically change if leaders led by example and people followed suit? Obviously, we don't live in an ideal world, but within the culture of your company, you do have the ability to set a standard of excellence and lead by example. Mr. Warren Buffet, Chairman and CEO of Berkshire Hathaway said, "In looking for people to hire, look for three qualities:integrity, intelligence, and energy. And if they don't have the first one, the other two will kill you." According to common sense and Forbes, "A person's dishonesty will eventually catch up to them. It may not be today, and it may not be for many years, but you can rest assured that at some point there will always be a reckoning". After all, you can trust a thief. But the trust you place in him is that with absolute certainty, you can trust him to steal. So, the first and most critical aspect of ensuring your business is grounded in unapologetic integrity, is to surround yourself with people who are unapologetic about their personal level of integrity. 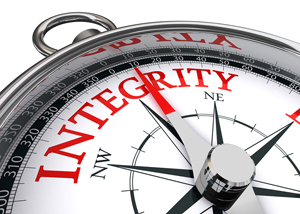 In the words of President Eisenhower, "The supreme quality for leadership is unquestionable integrity. Without it, no real success is possible, no matter whether it is on a section gang, a football field, in an army, or in an office". Integrity isn't a grey issue; it's a black and white decision that you must make everyday in a great many interactions and transactions. But in business, it makes the difference between a long-standing, loyal consumer base and one-time customers. Think about who you personally conduct business with and why. What are your reasons for choosing that particular person or product? Businesses considered "shady" or "of questionable integrity" may at one time have been able to remain in business. But that was before people had choices and certainly before negative experiences could be immediately shared, posted, and reviewed for literally the entire world to see via social media and internet-based review sites. And I assure you, bad news travels much faster than good. Regardless of your industry (unless you are a utility company…speaking of which, what is up with the monopoly on that in every city in the US??!?!?) you will most likely have very strong competition, which is the trademark of a society that is driven by free enterprise. We are the land of the free, which means we have choices with whom we decide to exchange hard earned dollars for a particular product or service. If you want a highly selective and informed demographic to choose you over your competition, you must earn that honor. What better way than to begin with an integrity-driven company? I was going to list companies and individuals setting the best example of integrity in business. I changed my mind. Instead I suggest that you be the example of integrity in business. Conduct business beyond reproach; it will serve you well. Make the decision to only conduct business with other companies who display the same standards of excellence. That will serve the business community well. And then choose to carry that forward in your personal life with your interactions with others. That will serve society well. Set a culture within your company that first and foremost, whatever else you do that people might take issue with, your integrity will remain unquestionable. People will forgive most mistakes or errors if they know that it was an honest one. However, integrity once lost is gone forever. Hold tight to yours and your business will be the greatest evidence of it and the rewards it brings.